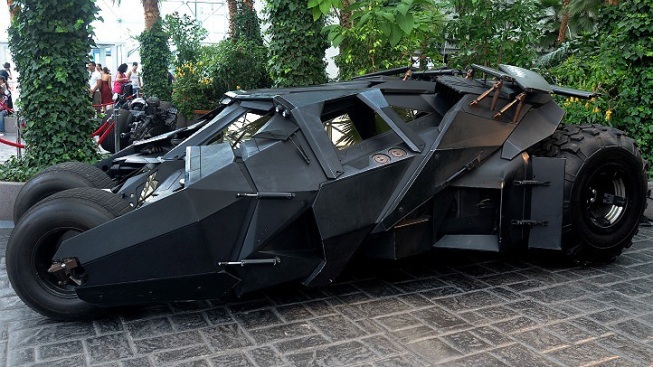 Coast-to-coast tour is gearing up to promote "The Dark Knight Rises"
The Bat-Pod and the Tumbler (the vehicle, not the blogging service) will be spinning their wheels in the District on Sunday, May 27. The coast-to-coast tour of the crime-fighting rides is gearing up to promote "The Dark Knight Rises," which opens July 20. The Tumbler, a modified prototype of a military vehicle, was featured in both 2005's "Batman Begins" and 2008's "The Dark Knight," with the Bat-Pod making its first appearance in the latter. The Bat-Pod, for those not in the know when it comes to superhero vehicles, is a motorcycle that ejects from the Tumbler. We could see that helping in Beltway traffic. "Do Batman a Favor: Get Better"
News4's Pat Collins meets the caped crusader who travels the region visiting children at local hospitals as one of their favorite superheroes. There's no word yet on where, exactly, they'll be in town, but planners will release specific details a few days in advance. In the meantime: They have a website, a Facebook and a Twitter, but... not a Tumblr? No, wait, the website is a Tumblr. Thank you, Batman.